CORMORANTS. Phalacrocoracidæ. – Bill with a hooked tip; a small pouch at its base; plumage usually black or blackish. 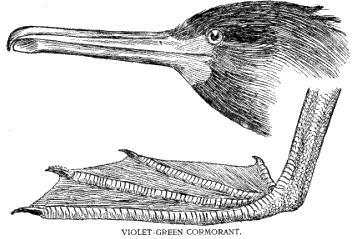 Cormorants nest in large colonies, generally on isolated islets, but sometimes in remote swamps. The nests are placed closely together on the ground, in bushes, and less frequently in trees, according to the nature of the bird’s haunts. 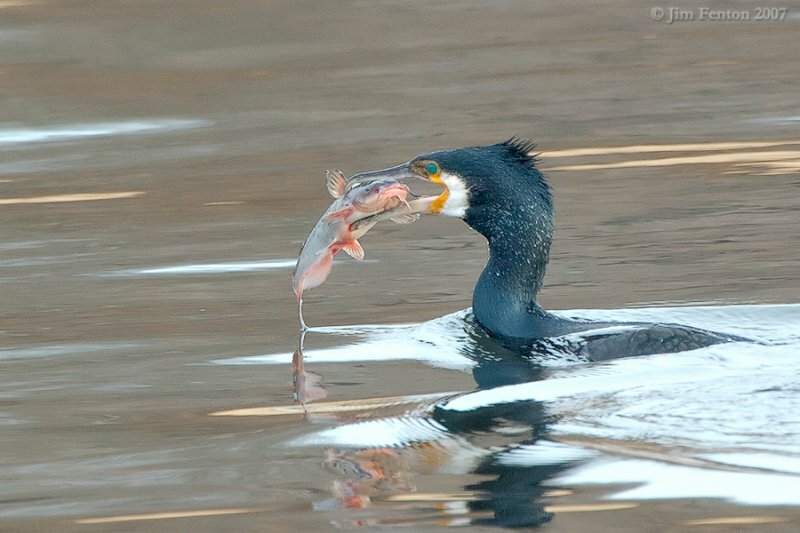 Cormorants feed on fish which they catch by pursuing them under the water. They dive from the surface of the water like Ducks, or from a low perch, but not from the air, as do the Gannets. The members of this Order agree in having all four toes connected by webs, but in other respects they differ widely in structure and, consequently, in habit. The young of all the Steganopodes are born naked, unlike the young of most of the other water birds, which, as a rule, are hatched covered with feathers and can swim or run about soon after birth. The nests of the Steganopodes are, of necessity, therefore, more complex structures than those of birds whose nests are merely incubators and not cradles as well.